Lottie's Interiors: More tea Vicar? Trend is a funny word. What does it mean to be 'trendy'? Does it mean you are good at following trends and implementing them or does it mean you are forward thinking and create your own? I was recently asked by a friend if Orla Kiely (the design, rather than Orla herself...) was ok or....a little too try hard.....a little last year? I guess my honest answer would be 'yes' to all of those three from a 'trend' perspective....but who gives a fig about that? I didn't want to reply in the style of a man/husband/partner by saying...'If you like it, I like it.' Or....'If you like it, that's all that matters.' That would be just plain annoying as we all know! Though, in actual fact, that is all that matters. If you like it, go with it. I do appreciate the dilemma though. There are certain designs/designers around at the moment that have dominated the high street for some time meaning that if you have an eye for originality, you should probably steer clear as it is bound to niggle visiting houses and seeing the same quilt cover, cake tin, apron, bag or hand painted animal mug! 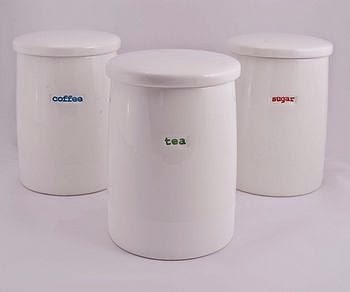 On a slightly more mundane topic, I have been tasked with finding some storage containers on the high street for tea and coffee. Not that easy for someone who doesn't drink either on a regular basis and therefore hides them away in a cupboard. So these are the ones I came up with and they vary in price to nice but not so reasonable to not so reasonable in my opinion! 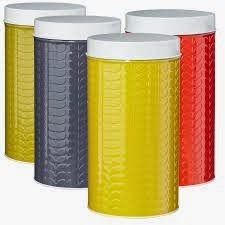 I'm a fan of colour, especially if your storage jars are going to be out on display. The ones below are definite display items....not to be hidden away in a cupboard. The two below from Habitat are possibly my favourites, with the Balham on the left coming in orange, yellow and grey and the Tira on the right in orange and white with the stripes. Range from £10.00. 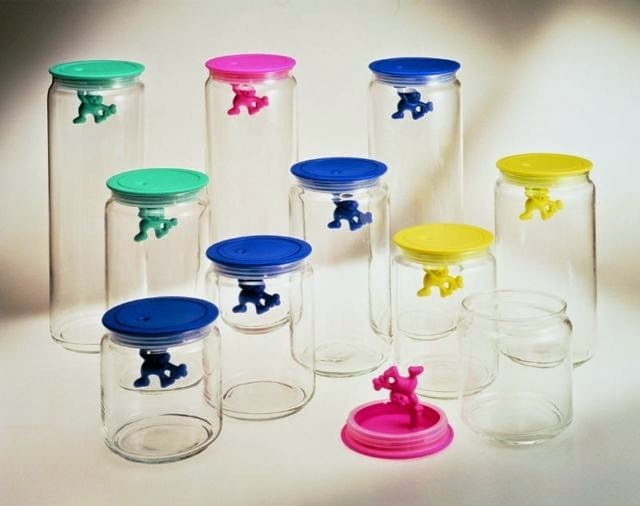 The Alessi 'Gianni' jars below left start at around £12.00 ﻿and are both a bit of fun and a design classic. 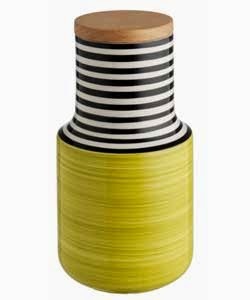 Going back to Orla Kiely, I do happen to like the colours of the raised stem canisters below and this range starts at £10.00. 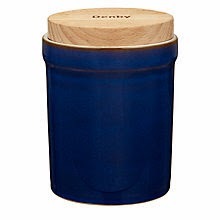 For a more classic, country look the jar below is by Denby with a starting price of around £27.50 and in a variety of colours. 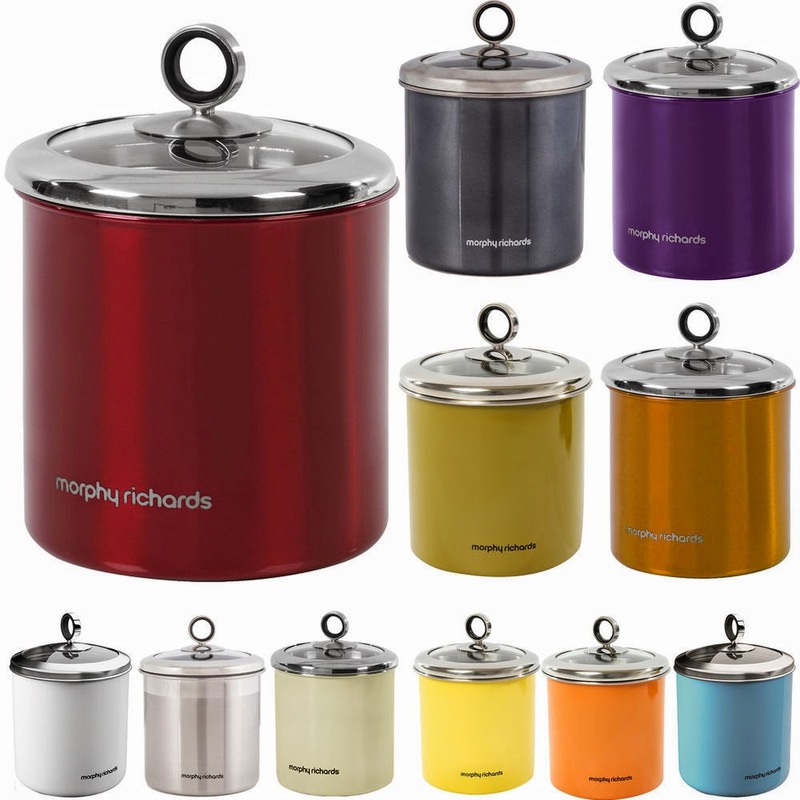 Morphy Richards range start at approx. £12.00. Very nice, but a little bit of a budget buster are the ranges above, both from Not on The Highstreet.com. The first range is by Tom Gloster and are £89.50 for a set of 3 (ouch!) 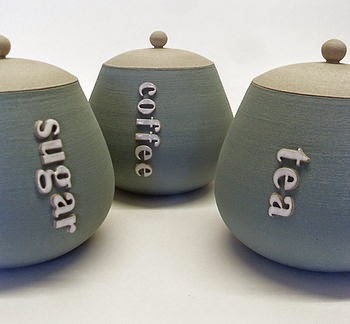 and the white coffee, tea and sugar jars are £26.95 each. 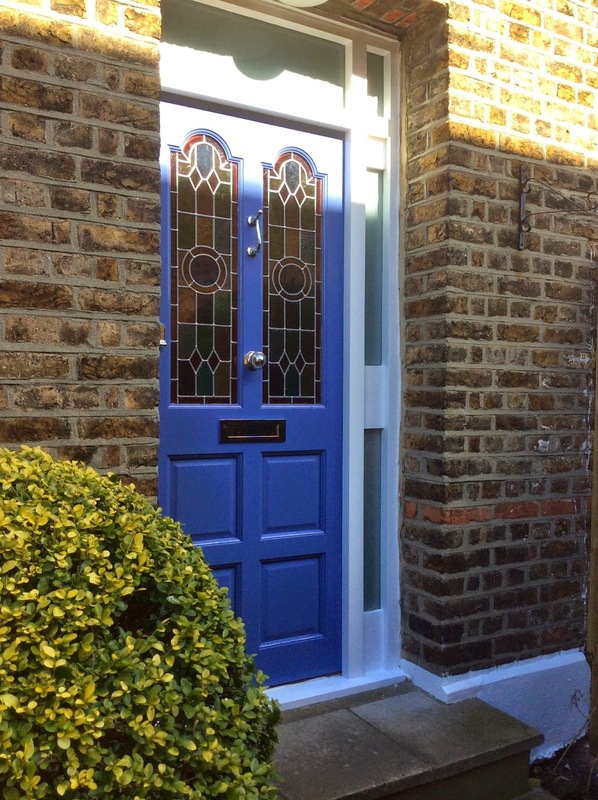 And finally, on a completely different note, before I run off and do the school run, this is Lottie's Interiors reader Sue's newly painted front door. Inspired by reading one of my most popular posts yet on front doors! It looks the great, Sue. Very smart! For anyone interested, the colour is Farrow and Ball 'Pitch Blue'. Feel free to send me your front door pics. I'm looking for inspiration!